But before we get to that, here’s a summary of the other changes. There are new versions of many of the standard applications. Sonic Pi is now at version 2.9. A full list of changes can be found in the History section of the Info window in Sonic Pi, but the highlights include two new effects functions, a new logging system, and the inclusion of all of Sam Aaron’s articles for The Magpi magazine as part of the online tutorials. Scratch is now at version 20160115. This has improved sound input capabilities, support for the CamJam EduKit 3 robotics board, basic PWM support in the GPIO server, and various improvements to the display, including font scaling. Mathematica is now at version 10.3. This adds support for a larger set of the functionality detailed in Stephen Wolfram’s new “Elementary Introduction to the Wolfram Language” book. It also supports the use of the Sense HAT, adds interfacing to Arduino, and includes many new Mathematica functions. Node-RED is now at version 12.5 – this adds no significant new functionality, but fixes a number of bugs and contains some internal performance improvements. WiringPi has been updated to version 2.31, which allows GPIO pins to be accessed from applications that use the library without needing to use sudo. For more details, see the WiringPi website. The RPi.GPIO Python library has been updated to version 0.6.1 which includes some bug fixes which affected the new GPIO Zero library. The Java platform included has been updated to version 8, update 65. The volume/audio device icon on the taskbar is now compatible with a wider range of USB audio devices – people reported that it was impossible to set some USB sound devices as the default output. Due to the way the ALSA system works, it is very difficult to make this completely infallible, but the new version should work with a much wider selection of devices than before. The Main Menu editor now allows new menus to be created. In earlier versions, due to an issue with the way the LXDE desktop environment interpreted its configuration files, creating a new menu caused all other menus to be hidden – this should now work correctly. The GUI Raspberry Pi Configuration and command-line raspi-config applications now offer the correct overclocking options on all Pi 1, Pi 2 and Pi Zero boards. There are also some updated language translations submitted by the community – many thanks to the translators! The ping command no longer requires sudo. We hope the above changes are useful, but Raspbian will still look pretty much the same as it did for the last release in November. But we have been working on one other thing behind the scenes for this release: this won’t be of interest to most users, but for some, we hope it will be very useful. With the standard software renderer, this runs at around 23 frames per second, flickers a lot, and doesn’t actually show the correct colours. If you try it again with the new driver enabled, it runs at the screen refresh rate of 60 fps, with no flicker and the correct colours. This barely runs at all under the software renderer, but is quite slick and playable with the new driver. Or try Oolite, which looks quite similar to another game that those of us of a certain age remember fondly. Bear in mind that this is an experimental release of the driver which we are making available to the community as a public beta test; it is still slightly unstable, there will inevitably be some graphic glitches, and you shouldn’t expect every OpenGL program to run perfectly. It also has some side effects, notably in terms of making small changes to the way normal windows and menus are displayed. For this reason, we’d advise only enabling the driver if you know that it is going to be useful for some specific program you are using; if you’re not sure whether or not you should be using it, you probably shouldn’t be! Also note, this experimental driver may break Raspberry Pi Camera and video playback support, and perhaps other GPU functionality. We strongly advise that if you are going to try out the experimental GL driver, that you backup your SD card first. So does Quake III run with more FPS with this experimental driver turned on? I think Raspbian is still shipping an openarena linking against the closed driver. I’ve done a bunch of testing with stock openarena, but it’s slower than the custom ES build because we keep having to translate their 4-byte index buffers to 2-byte. You guys rock. Been waiting for the Pi2 to have OpenGL for quite some time – thanks for your great efforts. Had hoped for a video of one of the games. With Scratch now having support for the CamJam Edukit 3, does this also include the HR-04 ultrasonic sensors…PLEASE!? Darren, sorry but no ultrasonic sensor support yet. It’s actually quite tricky to do well in the scratch framework for sensors. You *can* just use a couple of gpio pins, a timer black and maths etc but it has dreadful resolution. I’m trying to work out a clean way to handle it. Small request for a future tweak. Any chance you could make the mouse double click speed in the desktop environment configurable? My kids find it quite difficult to do it quick enough at the moment and I can’t find a way to change the speed. there is a hidden file named “.gtkrc-2.0” in your home directory. So if it does not exist, create it. If it does exit, read it before you proceed — it may advise you to use “.gtkrc-2.0.mine” instead. Press Ctrl – X, y and enter to save and quit the editor. restart your Raspberry Pi for it to take effect. Sounds good – I will give it a try. Thanks. Now that the experimental driver is out, is it now more likely the be able to run OpenRa on a Pi2? In the past I hear that OpenRa on Pi was not possible because OpenRa only use OpenGL. Yes, more likely to work. May work without any changes. Someone will have to try it, but it is certainly possible. there’s no sound and it’s too slow, so not that playable. easy to install from openra.net. Did you use a precompiled binary? Or did you compile from source? When have you deployed it? Since the weekend a dist-upgrade will break my Pi2. Libc6 has not all required dependencies and I am not able to do apt-get upgrade or dist-upgrade any longer, because the config files are not containing proper dependencies. I have tested upgrading from the old image without any problems, but of course there may always be problems which don’t come up in testing. Which dependencies aren’t met? Extrahiere Vorlagen aus Paketen: 21%E: Debconf-Version konnte nicht ermittelt werden. Ist debconf installiert? Extrahiere Vorlagen aus Paketen: 42%E: Debconf-Version konnte nicht ermittelt werden. Ist debconf installiert? Extrahiere Vorlagen aus Paketen: 64%E: Debconf-Version konnte nicht ermittelt werden. Ist debconf installiert? Extrahiere Vorlagen aus Paketen: 85%E: Debconf-Version konnte nicht ermittelt werden. Ist debconf installiert? Vormals nicht ausgewähltes Paket gcc-4.9-base:armhf wird gewählt. Vormals nicht ausgewähltes Paket multiarch-support wird gewählt. Vormals nicht ausgewähltes Paket libc6:armhf wird gewählt. Vormals nicht ausgewähltes Paket libgcc1:armhf wird gewählt. I have to setup a fresh installation. Thats great news on the open GPU driver. Thanks. I while ago there was a suggestion that it might be possible make a minimal opensource version of the blob that is required to boot the Pi . Has there been any progress on this? It would be great if Pi could be free enough to bounce up a few levels on the FSF single board computer list  and be recommended by projects like freedombox . Does this mean the full version of Minecraft may work ? Maybe, if they have a Linux version of Minecraft available, that is compiled for ARMv7 (which isn’t likely). You might need to ask Microsoft for that (Microsoft bought Minecraft, if you didn’t know). Minecraft is written in java. There is some java to opengl native library but it should be available for arm too. If you do try Minecraft, use Optifne… Might make it somewhat playable…. My Pi fell over during “sudo apt-get update” last night. Now it refuses to completely load X. Guess I’ll be doing a clean install tonight. Regarding Pi 1 – will the driver be available for it, too when it is out of beta – or only for the Pi 2? Err – did you read the instructions above? Now I need help….how to get back to a visible screenoutput? Micha, I assume that you backed up you card before using this “experimental” OpenGL driver? If you did not then at least you’ve learned one valuable lesson today. Of course this may not be much help in your current situation but if it reminds others to backup before trying something classed as “experimental” you might take solace from the fact that you have taken one for the team. Thanks for the reminder. If you did back up your card then revert to it and wait for the OpenGL driver to be less experimental. I also hit the black screen problem (on a Raspberry Pi attached to the Raspberry Pi 7″ Touchscreen). Just rewriting the SD from backup as I write this comment. I’ll make another attempt tomorrow. Just downloaded Raspbian Jessie 2016-02-03 and put on new uSD card, booted the Pi 2 with it, did sudo apt-get dist-upgrade etc. All went well. Is that correct? On a Raspberry Pi B 2 ? Apologies – I’ve just discovered that when I wrote the board detection routines in raspi-config, I neglected to take into consideration that some boards will have their warranty bits set. Thanks for quick reply! I’ll wait for it to appear in apt, it’s no biggie. Just thought I’d point it out as it didn’t seem right. Fantastic!! I run a Pi2 on a boat with navigation software (openCPN) which can use openGL, a massive improvement!!! Combine this with that fellow who made Netflix work in Chromium browser but the video was slow cause no hardware acceleration. Can we have hardware acceleration in Chromium with this? However, I do not get it to work. sudo apt-get install xcompmgr libgl1-mesa-dri – when I reboot, I’ll get a blackscreen after the coloured bootup-screen. Do I still miss something? A special memorysplit etc.? Any recommendations for GPU / CPU memory? GPU at 64 (my default for non-GPU usage) and oolite planets render very badly – lots of black and white triangles rather than the nice one pictured above. GPU at 256 and RPi 2 HDMI stopped working although RPi seemed to have booted otherwise. The GPU shouldn’t need much memory, but the CPU does need a large chunk while running the new driver. From memory, allocating more than about 280 MB to the GPU will prevent the Pi from booting with the new driver running. Feel free to experiment with these, but our recommendation is to keep GPU memory lower rather than higher. Minutes ago there seemed a change somewhere – after I tried update, upgrade+dist-upgrade again, there happened something at upgrade…but still without change – blackscreen after reboot. are the only active things in my config.txt (except oc)…any ideas maybe? Possibly the wrong hdmi-mode? There are three changes which raspi-config makes when the driver is enabled. All three changes need to be made to enable the driver; all three need to be undone to disable it – this is why it is a raspi-config option rather than something which we are encouraging people to do manually. If you are having to recover a trashed system, make sure you undo all three – look at the function set_gldriver in raspi-config for details. Recovering my blackscreen was easy with a second pc…but it does not change the fact that I am still not able to get it to work…I only g2t a blackscreen when activating the relating text in config.txt and reboot, whatever I do. I see no power-symbol, but to clearify out thats not the fault I pulled out everything from usb, without change. I wll now have a look at that fb-stuff relating to point 3 manually…..
I’m not sure if this is your problem but mine was working fine, then I changed the memory split from 128MB to 256MB and the Pi booted to a blank screen. I changed it back to 128MB and it booted to the desktop without a problem. I’ll try that, what I already know is that it does not work with 160 and 256. Point 3 what Simon mentioned is also not the propblem as the file is not there. Now I test it with 128mb-split….. I cannot find the problem by myself and do it as Andy – it does not work here, and I leave it as broken for now until it is fixed and works better. But I sill got a blackscreen with even 128…so I do not think that the memsplit is the reason here. Solved, BoB LeSuer found the solution a few postings after this…it is necessary to boot directly to GUI. It has the wrong screensize/resolution and is unusable here cause the bar and some icons are missing, but I see my background at all. I would hope that you can make it at least compatible across Pi models. I currently maintain a common rsync backup across my B+ and Pi2. It appears this will break if enable vc4-kms-v3d overlay. It would be good if Device Tree could handle the differences (as it does for most other changes). Yes, all changes are undone by raspi-config, including the re-enabling of the fbturbo driver – a backup of the relevant file is restored. Been waiting for it! Thanks for the OpenGL hardware acceleration and wiringPI update! Very impressive work on the driver. Are there any plans at the moment to work towards getting it on all pi variants (including the Pi Zero)? If it is impossible to reduce the memory requirements, then saying now will stop people hoping for the impossible. My concern is that with the driver on only the Pi2, then it will effectively split the available pi software in two – one set for all pi varients and one for only pi2. I think the open source driver should eventually become equivalent to the proprietary one in terms of speed and efficiency. It might take another two years though. The closed source driver doesn’t do much but when it can be used it’s probably faster. Furthermore Emulationstation doesn’t work correctly anymore, it just boots to a black screen. File this under “broken”, not “experimental” at the moment! I filed it as experimental – works OK on a new SD card. I did a sudo apt-get update && sudo apt-get dist-upgrade without any issues. Installed the other items, went into raspi-config and enabled the driver, rebooted. I do see periodically a black screen when its trying to render some 3d, like oolite. Basically the screen will go dark and the little rainbow square will appear in the top right hand corner. Its as if the Raspi isnt getting enough power when running 3d apps? Ive tried this with a PSU purchased from Adafruit and also when connected to a Motorola Atrix Lapdock, and I get the same issue. Thanks Simon! Will try without an inline switch and report back. 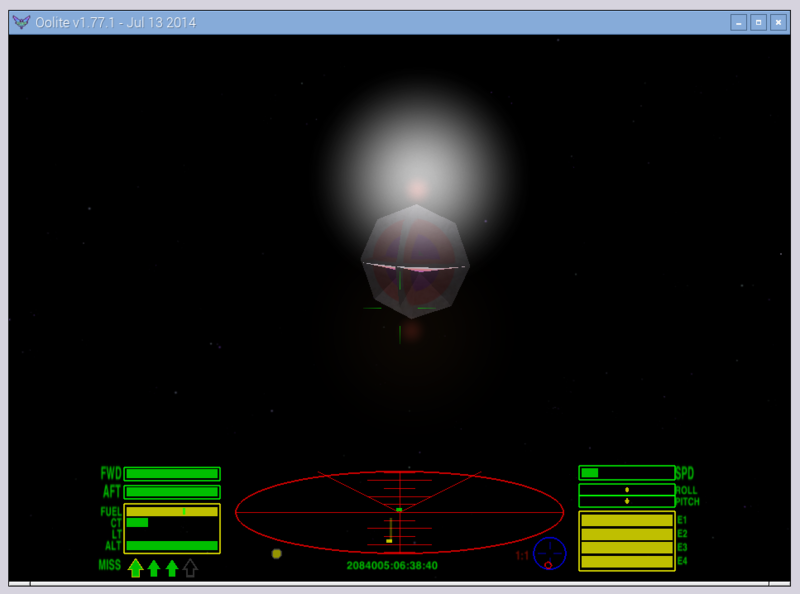 I did try oolite earlier on and its looks great running on the desktop. Thanks for your hard work and I look forward to further enhancements in future! Yeah I switched to another USB psu that I had lying around and Im no longer getting black screens or the rainbow square appearing at the top RHS. Now to source a usb power cable without an inline switch. So will Stellarium work smoothly after the hardware accelerated OpenGL support? Star maps are great. Text for me is corrupted. Celestia which is also in the repository functions better. First: Very nice news. Really hoped for this and even visited http://anholt.livejournal.com/ yesterday. Anyway. I don’t see the option to enable GL in raspi-config. Even after “update this tool to the newest version” nothing show up. I did apt-get update, followed bei upgrade and installed the mesa stuff beforehand but still nothing. Possibly missed “sudo dist-upgrade” after update+upgrade? Did a quick test and here’s a video of glxgears running without OpenGL and with OpenGL. Link to Tweet with picture showing the background colour is filling the whole screen. Link to Tweet showing standard desktop with a program running full screen. The piece at the bottom looks like the Status Bar is filling the rest of the screen. Also showing I hard set the resolution to match the monitor. Love that OpenGL works so well. Would love to have it fill the screen. For testing I moved the panel to the bottom and changed it’s colour to red. The panel moved and changed colour, but also everything from the panel to the bottom of the screen changed to red. Hi, Yes I’m getting the same effect, except my bar at the bottom isn’t as deep as yours, maybe only about a quarter as wide. By hard-coding the resolution to 1152×[email protected] I can get OpenGL to fill a 1280×[email protected] screen, but then the screen warns about 85Hz overdrive from time to time. Also have a strange problem where the bottom of the screen is filled with the background colour, but programs will not go there when maximised. Tweet with pictures showing the problem. Strange, my first comment did not appear at all. Okay next try: I followed all the steps above but I don’t get the enable GL-Driver option in raspi-config. What could cause this? Really would like to try out the driver. I did update, upgrade, dist-upgrade + rpi-update and selected update to newest version of this tool in raspi-config before commenting here. The option was still not available … and yes ist it a raspi2, memory-split is set to 256 but I tried with 128 as well. Can we install OpenGL driver to the old Raspbian Wheezy? If yes, does it require any extra steps? Not an answer – but why do you still want to use Wheezy, is there any good reason? All our devices (including remote ones) are loaded with Wheezy. We don’t want to do distribution upgrade since we don’t want to risk bricking our devices but we do small maintenance updates or some software installations. So if we can install the driver without doing the big distribution update, we would prefer to do that. In that case you shouldn’t try installing a driver that is clearly marked as experimental?! If you are too risk-averse to install Jessie, you really shouldn’t touch the new driver! How hard is it to get an answer to a simple question? Just tell me if it can be installed to Wheezy and that’s it, that was my question. If you don’t know then don’t fill here with unrelated comments. I didn’t ask your “valuable” opinion on how to handle the update process of our devices. Do you know our product? Do you know our testing process? Do you know about our company strategy? Maybe OpenGL is so key and will provide so much benefit that we will take the risk of bricking our devices? Maybe out of tens of test installations OpenGL driver will not brick any Raspbian Wheezy devices so we will take that small risk? Again I ask “just out of curiosity” is this new OpenGL driver installable to Raspbian Wheezy or do we need to upgrade to Raspbian Jessie? This so awesome. Seeing glxgears running on the Pi at 50 odd frames per second and using only a few percent CPU takes me back to the day I first got accelerated OpenGl running on Linux. Using a shiny new 3DFX Voodoo graphics card back in 1999. Now where is that browser that supports webgl ? hi , would u mind refer more about how to support webgl with latest raspbian. After removing that line all works as expected. now maybe we can get OpenFL (yes the F is no typo) and other haxe-libraries to run on X11 in a window in the near future, and make the Pi2 a supported target! my mirror not updated perhaps ? apologies, also finally can run Blender! Needed to do a sudo apt-get update before neverball would install. openarena is running wow thats a great. For what it’s worth, if my RPi is set to boot to console, then I get a black screen (following the full-screen rainbow splash). If I have set to boot to the GUI, then the driver seems to behave properly. AHH, thats the solution…the reason why I got a blackscreen all the time when activated GL! Checked it, if I turn the Pi to boot directly to Lxde, I got a visible screen. The screen still is total garbage, half is missing and the resolution was totally wrong…but I could see something. Still needs lots of work, but in general nice to see that the driver is functional at all! I installed an ran Blender. No idea how to use it but it functioned. I have noticed that Omxplayer no longer works with OpenGL turned on. Is this expected? I’ve also noticed other software seems to be running much more slowly e.g. I use Geany with several tabs open to edit source code. When switching tabs you can visibly see it drawing the text down the screen but if I turn OpenGL off it is back to full speed again. I realise this is experimental and maybe I am expecting too much at this early time? OMXPlayer acceleration on a Pi 2 in Kodi, for me, has always been easily broken. Simply play a video in the background (Background music visualization/video player on Home screen) and start scrolling one of your media libraries. Soon you’ll see the posters or banners start to vanish and the scrolling gets choppy or just plain freezes. ReloadSkin() brings things back to life but it’s a sorry state if you need OMXPlayer to run streaming media off the web where audio is sometimes corrupted into silence as well, depending on the source. So hearing that OMXPlayer doesn’t like this new driver isn’t all that surprising. This brings a whole new chapter for the Raspberry Pi 2! Now the GPU is ready to wake up from its hibernation. Can’t wait what the future holds! Ok, Im quite dumb about 3D so, this means games/apps written with opengl need can now be compiled to the Pi? and the openglES? what’s de difference in this case now? Bottom line is: Can I compile/run games natively made to opengl (not openglES) hardware? @Celso – OpenGL is the full version of the standard meant to operate on workstations and other systems primarily designed to generate the highest-performance 3D graphics. OpenGLES is somewhat of a subset with some reductions in functionality, missing features, as well as how the APIs are called. It’s meant for mobile devices with a system-on-a-chip (SoC) that doesn’t have nearly as much GPU horsepower as workstations and 3D graphics rendering engines/farms have. The VideoCore IV GPU in the Pii is one of the most powerful in 32-bit SoCs, so it’s very exciting to see that they’ve managed to get OpenGL running on it, especially integrated with the desktop (well, to a degree, as it’s a bit buggy on the lower part of the desktop, apparently). OpenGLES applications should still run as different libraries are referenced and linked with during builds. The demos in /opt/vc/src/hello_pi are built using OpenGLES and still build and run as before. For those not familiar, type “./rebuild.sh” without the quote marks from that directory. Then, for example, cd into hello_triangle and type “./hello_triangle.bin” (without quotes), and marvel at a rotating cube with images mapped onto the six sides. It’s great to see accelerated OpenGL – but it would be better to mention enabling it completely KILLS ALL CAMERA SUPPORT, as well as accelerated video via omxplayer…. I realise its an early release, but the blog above ONLY mentions “minor graphics glitches” – not core features stopping working !! Grumbling aside – I’m happy to use the OpenGl support on a different SD card as needed, now I know the llimitations. No doubt future updates will improve. The page above has been edited now, so loss of camera is mentioned. Thanks JamesH ! I use the Atari Stella emulator and it worked brilliantly in Wheezy. When Jessie was released it was broken and could only be started in ‘software mode’ which was unuseable. This new driver has enabled me to use it again at full speed BUT only in a small window – when set to full screen it slows down terribly. I have looked at the settings and enabled OpenGL mode but it still won’t work properly full screen. I wonder why all was perfect in Wheezy … ? When I first read that there was a new OpenGL driver I thought, big deal, the GPU has been running OpenGLES since Day One, who cares? Then I was reading through the comments and realized that they hadn’t accidentally left off the “ES” … it was full OpenGL support … on the desktop, at that! O … M … G … L … !!! I’m stuck on a 100 Kbps Internet link for the moment, so it took a few hours to get the new distro downloaded, but now I’m ready to jump into 3D hyperspace!!! This is enough of an advance for me to resume development of my long-planned STEM educational game, Pi-finity! Not being able to run it integrated with the desktop was highly unsatisfactory, but now that hurdle is mostly crossed and there are lots of other parts beyond the 3D graphics that need to be completed anyway, the most important being the P2P data sharing that obviates central servers being needed to maintain coordinated state across systems on the network. I have Spring break coming up in a month and the Summer when school will be out, although I will be running computing Summer camps, Jams, and possibly Jamborees across the U.S., so I will be plenty busy, as usual. If I’ve made enough progress by then though, I’ll be able to publish a draft API and enough code for the basic functionality to run and then perhaps contributions by others can help accelerate development of the full system. Setting screen resolution in /boot/config.txt does not seem to have any effect? So is it significantly hardware accelerated to use Android ? what needs to be done to get an open source android to boot ? There are some youtube videos of Android on Pi (using Eric’s 3D driver). Early days, but it’s looking interesting. Could I just ask how do you go about installing it and getting it to work? I would like to try this on my Raspberry Pi as well. Appears to work very well indeed! I did an upgrade on a running Jessie and activated GLX in raspi-config. At first I was getting the flipping screen with the color square, after changing the PSU it was ok. It will run e17 great but I have an overscan problem which will not be affected by changes of overscan setup in config.txt. The overscan problem appears even after booting in text mode. All in All it looks very promissing! Only getting the rainbow splash on my pi2 with the pi touchscreen, even when booting to GUI is enabled. I’ve got a similar problem with a Pi2. 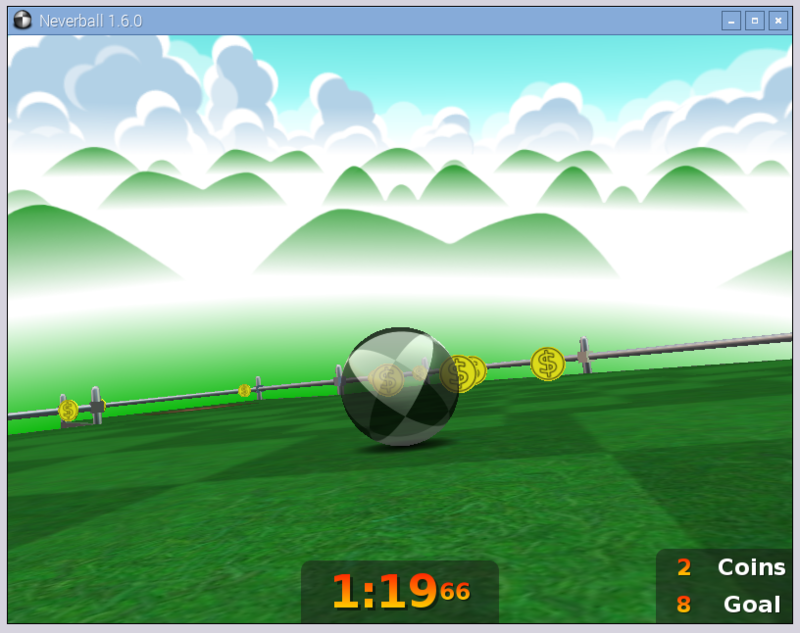 On a fresh install, it boots fine and the driver works nicely – I watched the gears spin at 60 fps and played neverball. Great fun! I then thought I’d update an existing Jessie SD card for the same pi, which worked fine right up until I enabled the hardware acceleration in raspi-config. When I rebooted, I just got the rainbow splash screen and nothing else. Multiple reboots did the same thing. allowed the pi to boot off the card once more. (I then went back to raspi-config and properly disabled the hardware acceleration). All is ok once more, though without hardware acceleration on that card. So, on a fresh image, the new driver works fine. On an existing image that I updated, running on the same Pi2, it freezes on the splash screen. Need to have more of a look around to see what’s different. I get the same with Pi2 and touchscreen, flashed jessie to card, boots ok, set GPU memory to 128, reboot ok, turn on GL driver, reboot – rainbow screen. But I have seen it running once over RDP. I turned on camera, SPI and I2c support in raspi-config and overclocked to 1000MHz. Memory split unchanged from latest Raspbian image. Maybe I forgot one of these settings when the driver was running without problems. At the moment the Display is connected to the Pi2 but not to a power supply. I added the power supply only when the Pi failed to boot. Fresh install raspbian jessie on raspberry pi 2. Runs great. Haven’t tested the render time. Seems to work nicely on my pi2 with just one exception. After enabling the openGL driver and rebooting I seem to get 1 (or maybe 2) columns of magenta pixels at the very left side of my screen – this occurs both in the console and in the X Window System. Disable the openGL driver and reboot and the purple columns disappear again. Is the new driver Eric Anholt’s open source driver? I wonder if it will be used for everything even when there’s no OpenGL, including the high res framebuffer. A few days ago I tried a custom build (http://sukzessiv.net/~gohai/vc4-buildbot/build/), but now the site has no builds anymore and says in a few words something that could be interpreted as if the current Raspbian (if the new driver is enabled) works completely without the closed source driver. Are there any differences between the build from http://sukzessiv.net/~gohai/vc4-buildbot/build/ and the current raspian jessy build? Chromium Browser for ARM is not in the Debian Repositories. Also it is difficult to backport Chromium to the RP1 ARMv6 Architecture, as it was only supported up to version 28..
With just a little effort, I was able to get OpenMW running on the Raspberry Pi last night using the experimental driver. I only got maybe 10-15 FPS, but considering the developmental status of everything, it was still impressive and shows a lot of promise. After doing the upgrade, rebooting, enabling the GL driver, and rebooting again, the GUI would not come up again. My TV complained about invalid picture format or something like that. I was able to SSH into the Pi, disable GL, reboot again, and it’s working fine again, but for now it seems the GL driver does not work for me. Blackscreen troublehooting: Narrowing this down to an HDMI display config somewhere. Two different Pi 2’s – same PSU, SD card etc. – only difference is the display. One works (Panasonic TV), the other gets black-screen after rainbow (cheap off-brand TV). Again, no difference in the setup except the display. Tried hdmi_boost=4, hdmi_drive=2 ; no change. Swapped the Pi’s so the one that didn’t work is on the Panasonic, and vice versa. Pi that did not work on the small TV, now works on the Panasonic. Pi that worked before, show’s black screen when connected to the small off-brand TV. My tests showed the same conclusion, the new driver does output an unusual HDMI format which is incompatible with some displays. Upgrading from previous Raspbian or starting with a fresh install does not matter. Samsung tv no problem, cheap Watsvision shows black screen. How about swapping your HDMI cables for a test? When I enabled the new OpenGL system I got a problem where the raspberry pi would stretch the screen (or maybe the monitor) and the monitor would give an ‘out of range’ error. Is this a bug? How do I fix this? I have that same problem with SAMSUNG TV over HDMI. Top menu isn`t visible in Xscreen.In configuration without OpenGL working fine. I have the same problem with a 2010 vintage(?) Samsung TV. Half the menu bar is missing and the enabling/disabling overscan makes no difference. On a brighter note, a QT5 program which didn’t display with the older Raspian, now works properly, although not with OpenGL enabled. So big improvement there. Will have to try qtcreator Welcome and configuration again. Same problem with Panasonic TV. Enable/Disable overscan makes no difference and I can *just about* see enough of the screen left side and top to select (guess) the place to click. Disabling OpenGL brings things back to normal. I managed to get Minecraft 1.8.9 working for about 1 minute ! Some Processing programs wouldn’t run previously, complaining about the OpenGL. Does anyone know if these work now? It’s a game, where you can program bots in a language called CBOT, which is similar to C++ and Java. The game was recommended by ministry of education in Poland years ago. Now it is opensource, and managed by International Colobot Community. Same here: ping still requires sudo. Glad to hear that DRM driver has been included in this new release, so will there be someone working on some GPGPU stuff in this infrastructure, like a llvmpipe based OpenCL driver? Is it possible to have OpenGL on a dispmanx OR kms rendering context instead of an X11 context? Great news. A major advantage of the Raspberry Pi over other small board computers is its software support. With the new OpenGL, I was able to watch Avogadro gracefully turn around oxytocin, a nine-amino acid polypeptide. Very Nice. I was plaing colobot in my raspberry. Now I like. When will native GPIO screen support arrive? I have a screen and installing the drivers-from wheezy era-cause X to be modified to something that causes it to always crash. Also, the screen powers but just displays pure white. I can include link if needed. Or is it that the closed source driver does only support OpenGL ES vs. full OpenGL in the OSS driver? If this is the main difference then it should get more emphasis. After I rebooted with OpenGL the Volume Control in the panel disappeared, and when I try to add it back I get empty space instead. glxgears and Neverball works, but when I start Neverball sound doesn’t work and I get “Failure to open audio device (ALSA: Couldn’t open audio device: Filen eller katalogen finns inte)” (I use Swedish language). I normally use analog sound. Also, the lower part of the screen can’t be used — it’s the same gray as the background. I have a 4:3 screen, I think. I got audio to work by changing to dtparam=audio=on in /boot/config.txt, but I also had to add back the speaker icon (Volume Control (ALSA)) in the panel. I installed Processing 3 https://www.raspberrypi.org/learning/introduction-to-processing/requirements/software/ and then run the example Demo/Graphics/Planets, but after that my screen image is very wiggly . It didn’t help to restart the screen. I shall now try rebooting. None of my hdmi settings worked in config.txt; I got the black screen. HOWEVER, I put the video resolution as a kernel parameter and IT WORKED. Mine is as follows (note the video=..) parameter (it depends on the actual device of course). Just a follow up to my previous post, on my kernel parameter video=wxH the H seems to work only on H=768. I got the working combination (for my tv) by trying out values on output of /opt/vc/bin/tvservice (dump edid data, then parse, then try out the values). a cat of /proc/cmdline seems to help, there is a entry for bcm2708_fb.fbheight that is probably correct for the display device. I still have to use sudo to ping – any ideas why? Awesome! Cant wait to give this a spin at the weekend. Enabling Gl kills my Pi also, and I removed as much as I could from the USB port, and am also using a PSU with 2.5A. Will be keeping and eye on this one though, I’m excited to see it come out of beta! on my existing Jessie install using a HDMI-VGA dongle and an old monitor i’ve always had to use ‘custom’ HDMI settings in /boot/config.txt. Enabling GL driver gave me a blank screen. However removing my HDMI entries in config.txt, while still having the GL driver enabled allows it to work as it should. Disabling GL driver gives me no display on boot. With a clean install to an SD card, and making the raspi-config change, the boot stops at the “rainbow” screen. According to notation on elinux.org, a boot with the rainbow screen display means kernel.img is not loading. If by “rainbow” you mean coloured vertical lines, yes that’s what I’m seeing on my 7″ screen too. Fresh IMG on SD card with latest Raspbian also gives me a rainbow screen on the official 7″ touchscreen display, when open gl driver is enabled. But I really want it to run on the small screen. With any major updatea fresh install in a clean card gives the best stability. I took your advice and did everything you suggested. What I had missed doing was the firmware upgrade – I must have missed where in the instructions that was mentioned. I now do have 4.1.17-v7+ as you said you have. However, when I did cat > /etc/os-release it still says: … Version =”7 (wheezy)”. Also, PRETTY_NAME = “Raspbian GNU/Linux 7 (wheezy)”. Still no mention of Jessie. So how can I tell I’m running Jessie? Is there any way to get this nice ogl driver work with the PiTFT from Adafruit, or the Official 7inch touchscreen? By the way this driver makes the Raspberry so much better than the Android-clones like banana or cubie. Where do I get the matching header files (I want to compile the INDI driver)? A totally black screen unless the mouse is moved. As soon as the mouse stops, the screen is black again. Regardless of anything else. Any ideas what I was doing wrong? With GPU: 160 FPS, with CPU: 3 FPS! Thanks for the OpenGL update! Can we have VLC player running smoothly on Raspi 2 ? Can we have pppoeconf pre-installed ? These two things are essential for raspbian to be more acceptable. So I upgraded my Rasbian installation and once again my desktop got screwed up. People, I really like the regular updates Raspbian receives but there’s a big no-go in my opinion which is messing around in one’s home directory. Believe me, I’ve already configured the desktop the way I like. So to me the resetting to your defaults seems like forcing your desktop design on me. I know – my configuration is stored in the “oldconffiles” folder but why is it necessary to write in my home folder, guys? Today I took a few hours to test the experimental Open GL driver. 1) As already reported, blender finally works, but the right click used to select objects doesn’t. Surprisingly, right click with disabled experimental driver works though, but then 3d part of the scene is not rendered anyway (only the 2d HUD over the 3d scene). 2) supertux works great with 60 FPS using hardware opengl. However, supertux already worked before with 60 FPS using software renderer, but without GL effects. OTOH, running software opengl with effects had 1.5 FPS beforehand. 3) supertuxkart hard freezes on startup splash when using hardware opengl. Software emulation works, but is unplayable (<1 FPS). 4) extremetuxracer runs fine on hardware opengl for the first few seconds in 3d scene, but then runs with <1 FPS. I guess painting the belly track texture is giving RPi some trouble. Any chance to get Vulkan instead of OpenGL on day on Raspberry PI 2/3? My turn to thank you for that driver and to share trouble I had. * one didn’t support resolution. When OpenGL was activated, according to TV resolution changed from 1080p to something like 1150*??? (I don’t remember). So, like PaddyB, I changed my PSU (actually, it’s a smartphone charger) to a more powerful and it’s ok.
everything installed ok, enabled but no gl acceleration. Any experience with OpenGL on Raspberry Pi 3? glxgears runs at 37 fps with lots of flickering and judder. Neverball plays music by refuses to display anything and oolite is virtually unresponsive. Yep, i have same question. Does this OpenGL (and hopefully webgl) driver works well in Rpi3 ? Working fine for me on a RPi3 (multiple glxgears at 60fps). Did you enable the new driver in the advanced section of raspi-config and reboot ? Tried on my new RPi3, and didn’t work at first. Swapped my power adapter from 2A to 5A output and works fine. 2) With GL Screen turns black, one or two frames of tv then black screen 4-5 seconds then grey login screen. This is great! Thanks for the work you’re putting into this RPF. Thanks everyone, looking forward to goofing around with the accelerated graphics! Also, I’m going to try this on my other monitor to see if it fairs any better. Hi, I am a complete new starter with the Pi. I have the Pi3 and bought the Raspberry Pi 7″ Screen and stand. Followed all install instructions and all fine except image on screen is upside down. Contacted the PiHut and their response is … I do not know what they mean can someone help be more specific… i.e. where do I type this command?, what editor?. I have tried typing this in the Terminal Screen after the $ but no joy…. apologies if this is really basic !! “An update has been pushed to Raspbian to flip the screen ( rotate it by 180 degrees ) for a better desktop viewing angle. This makes it upside-down in our stand, so you’ll need to change a setting to flip it back. This will rotate both the LCD and the touch coordinates back to the right rotation for our display stand. Does the OpenGL support work on RPi3? From some of the earliest post it would appear so but I am not able to get it to work. I have performed the following procedures twice. After enabling the OpenGL support in the command-line version of raspi-config, and reboot, I only get a rainbow-screen. initially I was using the official 7″ touchscreen display and after scrolling the posts I realized there may be some problems with it. However, I restarted the process (installing fresh jessie and updating it), while using a regular 24″ computer monitor (with HDMI). After I enabled the OpenGL driver and rebooted, I get a blank screen instead (Rpi3 is plugged to an external monitor through HDMI, the 7″ touchscreen is un-plugged from RPi3). I am using the official 2.5A PSU. (and fix the apptoolbar, pls? :) ) Many thanks already. This is not a good place to post if you want to get Simon’s attention – it’s an old blog post. He does check the forums regularly. I run Raspbian Lite on Pi 3. I did dist-upgrade just yesterday. After upgrade I see unwanted disc activity – LED is blinking every second. Can somebody tell me, what is going on? How can I prevent this disc IO? After another upgrade, LED blinking is away. Much, much thanks! As soon as I activate the Open GL feature, the screen size on my Samsung ue55C6700 TV set gets misallocated. About 16 -30 pixels to each side are beyond the visible screen. I tried to allocate the screen size manually to no avail. I seems that the OGL feature completely surpasses the raspi-config and uses its own hdmi driver. As soon as I switch off the OGL, the screen size responds again according to the raspi-config. On my LG monitor m2380 there is no such issue. Did anyone else experience such issues? Any idea when we can get support of OpenGL 3.3, till today its 2.1, which is good but most of the recent code follows 3.3… Any time for this ??? does open gl work with the raspberrry pi 3?